We have been using Foot Levelers’ Stabilizing Orthotics for the past 23 years. In many instances your overall health can be helped by supporting your foundation. The feet are the foundation of the body. They support you when you stand, walk, or run. Feet also help protect your spine, bones, and soft tissues from stress as you move. By stabilizing and balancing your feet, Foot Levelers orthotics enhance your body’s performance and efficiency, reduce pain, and contribute to your total body wellness. 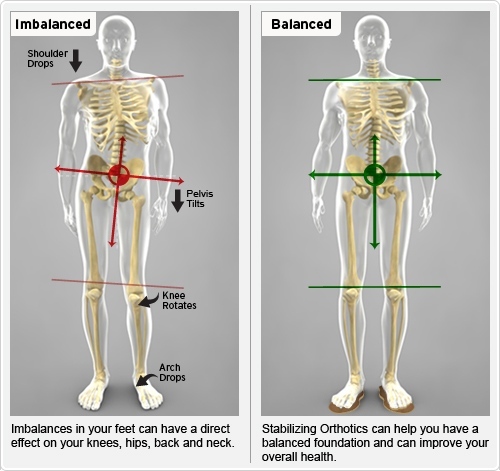 These orthotics can complement your treatment when you stand, w alk, and live your life in balance. Our office has been utilizing state-of-the-art technology to determine whether or not stabilizing orthotics would be indicated. Utilizing a digital foot scan we can evaluate how imbalances in the feet can lead to problems in the knees, hips, back and shoulders. The foot scan will show how Stabilizing Orthotics may help. Following a foot scan, a report will provide you a Pronation/Stability Index, a Foot Assessment, and a Body Assessment.